Hi, Creative Spark readers! It’s Bev from Flamingo Toes here today with a pretty Embroidered Crochet Coaster Set! I love crochet coasters – they are so soft and you can easily make them up to match your decor and style! These coasters have an added bonus – some are embroidered with encouraging phrases so they make great gifts for friends! I love these soft colors too – they are great for any season! In the materials list I have a free pattern for these phrases but you could change things up and embroider some monograms or even the names of family members. Begin by crocheting your coasters. Tie on and chain stitch 4. Slip stitch with first chain to form a loop.Round 1: Ch 2 (counts as first double chain). Double crochet 11 times in chain 4 loop. Connect to first chain 2 with a slip stitch. Round 2: Chain 2. (Counts as first double crochet) Double Crochet in starting loop. Crochet 2 double crochets in each double crochet around for a total of 24 double crochets. Connect to first double crochet with a slip stitch. Row 3: Chain 2 (counts as first double crochet). Double crochet in same loop as starting crochet. Double crochet in next chain. Crochet 2 double crochets in next chain. Repeat around, alternating 2 double crochet and 1 double crochet for a total of 36 double crochets. Connect to original crochet with slip stitch. Row 4. Chain 1. Single crochet in same loop. Chain 1. Skip one double chain and stitch 2 single crochets in next double chain loop. Repeat around for 18 chain loops. Connect with slip stitch. Row 5: In next chain loop crochet 5 double chains to create scallop. Slip stitch in next chain loop. Repeat around to form 9 scallops. Connect to first stitch with slip stitch. Tie off this color. Row 6: Attach white color (Cotton) with a slip stitch where you just tied off the original color. Crochet a single crochet in first two double chains. In third double chain of scallop, stitch 2 single crochets. Single crochet in each remaining double chain of scallop. Skip to next scallop and repeat around. Slip stitch in original stitch and tie off. Weave in all ends. Repeat for as many coasters as you’d like to make. For embroidery, transfer phrases to light colored fabric. Stitch phrases with coordinating thread using a back stitch for all lettering. Using circles on pattern as guide, cut out the phrases. Center the embroidery circles on a coaster and stitch to coaster with a zig zag stitch. If you’d like you could also hand stitch them to the coaster with a blanket stitch. Repeat for your other phrases. 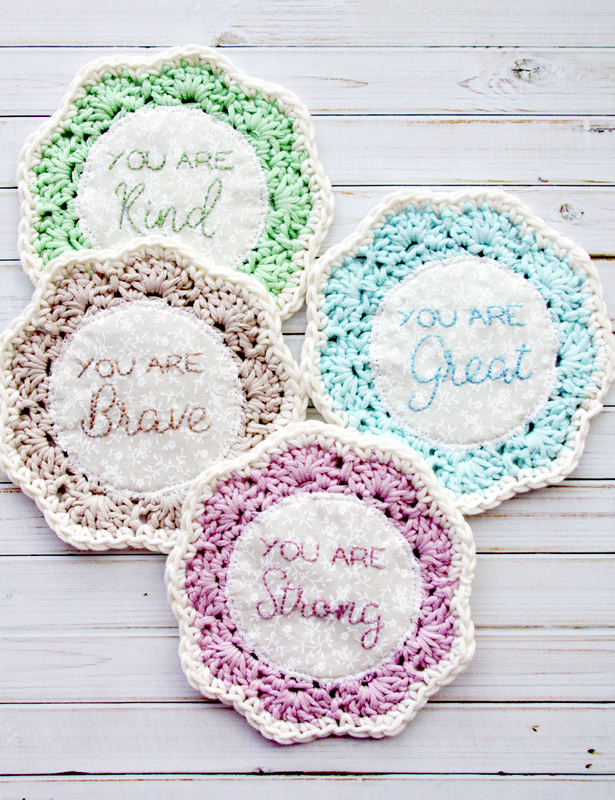 Now you have a cute set of coasters to encourage a friend with!